topoStitch™ offers the easiest and most accurate way to stitch topographic or greyscale images from Scanning Probe Microscopes (SPM’s), profilers, interferometers, confocal microscopes or any other instrument type. All images are placed automatically according to stage position coordinates when stored in the image files. Otherwise, the Grid Layout Wizard helps to lay out images in seconds. topoStitch™ even offers advanced snapping and semi transparent rendering, which makes it easy to place and adjust images manually. The advanced stitching engine in topoStitch™ allows you to create perfect and seamless stitches. 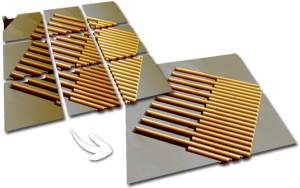 Sub-pixel correlation algorithms increase productivity by automatically offsetting, tilting, and aligning images with 5 degrees of freedom during stitching. Advanced memory handling and performance optimization allow stitching of hundreds and even thousands of 3D and greyscale images into one stitched image with more than 4 billion pixels. topoStitch™ supports 100+ file formats. For multichannel images, it is possible to choose only to load a single channel for each image. We offer all researchers, professionals and interested parties the oppurtunity to test our software.